What have you got in your fridge, right now? Prosciutto, black olives, clotted cream, Parmesan, smoked salmon, strawberries, Dom Pérignon? A long-forgotten, green-furred can of something that ceased to be fit for human consumption decades ago, a bottle of vile-smelling solidified milk and some distressing-looking wizened objects, obviously organic but now unrecognisable? Your clothes? (this is quite likely in Cuba where sensible souls chill their apparel before getting dressed on sweltering summer mornings). And your shoes? (doubly cool to run in frozen trainers). Nothing but beer? Whatever it is, you can bet it isn’t as interesting as what was in the 52 fridges exhibited during the Ninth Havana Biennial in the Convent of Santa Clara. These dinosauresque appliances, soon to be rendered extinct by the sweeping measures being applied to outlaw electrical inefficiency in this, —the Year of the Energetic Revolution’, were given to a crowd of world-renowned Cuban artists to use as they pleased for the Biennal. This year’s event went far beyond traditional exhibition spaces, making use of walls, streets, squares and even buses to attract both those in the know and to lure a number of somewhat bemused passers-by. Since its inception in 1984, the Biennial has gone from strength to strength and is now attended by artists from all over the world. Initially conceived as a competition, the event’s policy was fine-tuned from the Third Biennial onwards to focus on contemporary art in Latin America and the Caribbean, Africa, Asia, and the Middle East, with European, American and Japanese participants gradually being incorporated to arrive at the wide-ranging presentation that now takes over all the city’s principal exhibition spaces and spills out of them into numerous public arenas. Themes of past Biennials have included The Traditional and the Contemporary in the Fine Arts, the Third World Environment, Art and Society, The Individual and His Memory, Nearer to One Another, and Art with Life. This year, the Biennial was unified under the heading of Urban Cultural Dynamics with the aim, according to its organisers, of —drawing attention to contemporary visual culture, which owes so much to the pre-eminence of popular components in urban space. One of the most frequently visited, minutely examined and earnestly discussed aspects of the Biennial was an exhibition entitled Instructions Manual, housed in the former Convent of Santa Clara in the historical centre of the city. Created by painters Mario Miguel González (Mayito) and Roberto Fabelo, winner of the 2004 National Fine Arts Prize, its premise was creative treatments of old fridges, most of them from the 1950s, which served as jumping-off points, media, even canvases for painters, ceramicists, photographers, sculptors, installation artists and engravers. In Cuban households, the refrigerator almost becomes one of the family, its idiosyncrasies being regarded with affectionate exasperation by its owners. When the fridge seems to give up the ghost, everyone in the house knows exactly where to kick it in order to galvanise it into giving a tumultuous shudder and noisily starting to work again. In a climate like the Cuban one, being fridgeless is no joke, so everyone devotes considerable energy to cosseting their refrigerator, indulging its little whims and fancies, and ensuring its constant electrical supply in the face of repeated power cuts. New fridges are coveted; classic fridges, like the classic cars in Cuban streets, are ingeniously kept going for decades after their sell-by date. Fidel refers to them as —dragons which devour electricity’ and has vowed to root them all out and replace them with energy-efficient Chinese models. A quick tour round the halls, corridors and courtyards of Old Havana’s Convent of Santa Clara, now the National Centre for Conservation, Restoration and Museology, revealed some extraordinary surprises. The perfect finish of full empty by Rafael Pérez Alonso constituted a fascinating reflection upon relativities. Ángel Ramírez presented onlookers with an austere confessional entitled Talk Maria. Logos, by Carlos Omar Estrada, was Fridge-as-Hifi-System emitting —found sound’ from the everyday environment. David Rodríguez’s Yesterday, once more, took the form of a large and rather unwieldy clock, a witness to transience and the merciless passage of time. Good-Bye Rocco, by popular actor Jorge Perugorría, who played the lead in the film Strawberry and Chocolate, is composed of a fridge-coffin, suitably embellished with flowers, where the open space in which one would normally observe the face of the deceased is occupied by the appliance’s ancient, worn-out motor, and whose attached —funeral oration’ is penned by film director Juan Carlos Tabío, the whole paying homage to the greatest of all Cuban film directors, Tomás Gutiérrez Alea. 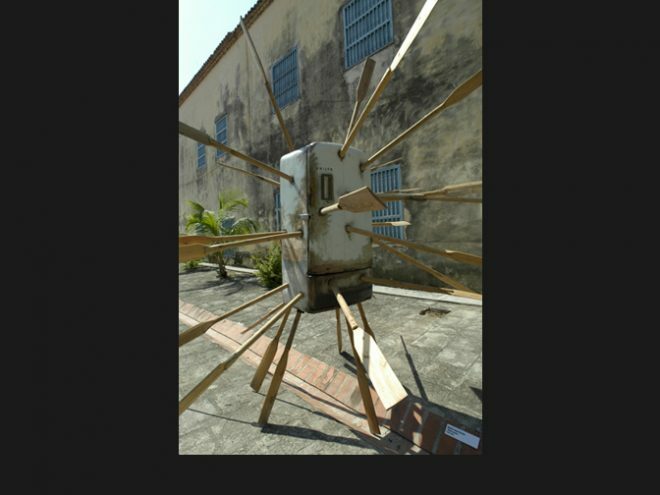 Commemorative Tribute by Nelson Domínguez is dedicated to famous tobacco grower Robaina: a bale of tobacco leaves forms the pedestal of the sculpture and a typical piece of Cuban furniture, the ?taburete? chair, is his throne. With a characteristically Cuban flash of humour, Alejandro and Esteban Leyva painted a massive General Electric in olive green, hung medals on it and baptised it —General Electric’. Whether in wild, polyhedral expression of themes that the artists had previously only visited in two dimensions, or in the manipulation of the original objects to give them entirely new meanings and associations, these fridge-confessionals-cars-walls-boats-locks-thrones-cages-clocks-coffins-containers-icons-pools-ovens-lamps-houses-bookcases; these suffering, happy, gory, ironic, agreeable, iconoclastic, calming, sarcastic, irreverent objects represented a riveting expression of the vitality and diversity of contemporary Cuban art, and of the symbiosis between art and everyday life, stretching to the utmost the expressive potential of a humble yet indispensable appliance. It was a cool response to a torrid spring.